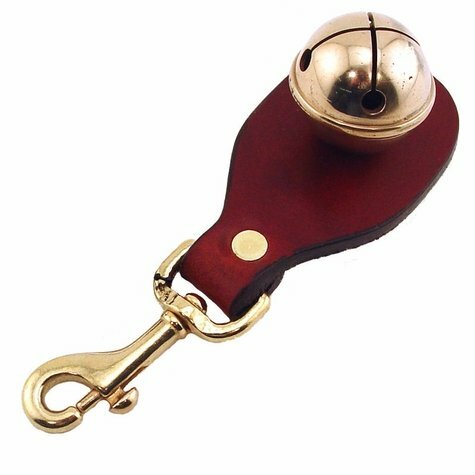 Leather Snap Bell for Hunting Dogs. $12.95. "I have bought multiple things from Steve and have always been very satisfied with my orders. They always get shipped within 24 hours and are at my house within 2-3 days tops." I have bought multiple things from Steve and have always been very satisfied with my orders. They always get shipped within 24 hours and are at my house within 2-3 days tops. The prices are very competitive to the other sites I have looked at. You WILL NOT find a better site to buy your hunting dog needs. "Use this bell for the Weims, and it is excellent for these dogs." Weimaraner and English Setter. Hunts. Use this bell for the Weims, and it is excellent for these dogs. English Setter is very hard hunting and tough on equipment. I'm afraid bell would be torn off relatively quickly, so I use a different style bell for the Setter. "She doesn't try to chew on it, as she did with the one more cowbell-like that I bought locally." She doesn't try to chew on it, as she did with the one more cowbell-like that I bought locally. "Perfect for mountain living! My son does not worry now about losing his dog!" Perfect for mountain living! My son does not worry now about losing his dog! "Works a lot better than the stuff sold on ebay." Works a lot better than the stuff sold on ebay. Really helps detecting his direction. Thank you. Great bell. The jaw on the snap could have a wider opening.
" Takes a lot of motion to make it ring. My 12 year old chocolate lab moves pretty slow." Not loud enough. Takes a lot of motion to make it ring. My 12 year old chocolate lab moves pretty slow. "Can't hear it. It moves too much to rattle the bell." Can't hear it. It moves too much to rattle the bell. Overall length is too long. When the dogs are running, it flops around and hits them. Brass bell with mini-snap connector with leather backing.